Chapters across the country collaborate to ameliorate. WiSTEM's success is founded primarily on collaboration and communication between our chapters across the nation. Our initiatives and general programming, developed by our founding chapter, have been widely adapted at different high schools and spearheaded by the chapter ambassadors. When we're looking to encourage diversity in the STEM fields, we understand there is a need for diverse perspectives within the program. Our nationwide collaboration implies the constant and efficient exchange of information and effective policies. This helps us ensure that our different programs are properly implemented at all of our locations, while also motivating further change and success. While we were founded in Chicago, our national expansion has been the initiative that has been the most invaluable to the core of the program. It's been an amazing experience for us to hear from girls from new places and to expand our views and perspectives. We hope that through an expansive presence, we can make sure that our program meets the specific needs of each community. Underrepresentation is ubiquitous, but the challenges it poses are constantly changing and unique to every location. Ambassadors, the leaders of the different chapters, serve as representatives and spokeswomen for their schools and communities. Beyond leading their own chapters, ambassadors are a part of our broader programming and are constantly looking for ways to improve and grow. We’re always looking for innovative initiatives, and this is the place where they’re fostered and where they begin. They not only bring their unique ideas to the table, they also bring a renewed passion to advocate. WiSTEM recognizes that if we want to make our voices matter, we have to go beyond the discussions, and rather, unify our thoughts and ideas for a greater purpose. We must take our different perspectives and use them to advance our agenda for equality and representation. Our generation is in the midst of a revolution for equality, and we're lucky to be a part of it. If all those with a passion to advocate, with a desire to achieve equal opportunity, and with a voice can collaborate and cooperate, we can all ultimately lead the march to the common ground of equality and justice. WiSTEM is looking to give high school girls a voice and a passion because while all of our specific initiatives and efforts make us up, we're more than that. We believe that the people involved, whether they're ambassadors, members, or just girls, are the heart of our organization, and we’re looking forward to seeing where we can all go together in the future. 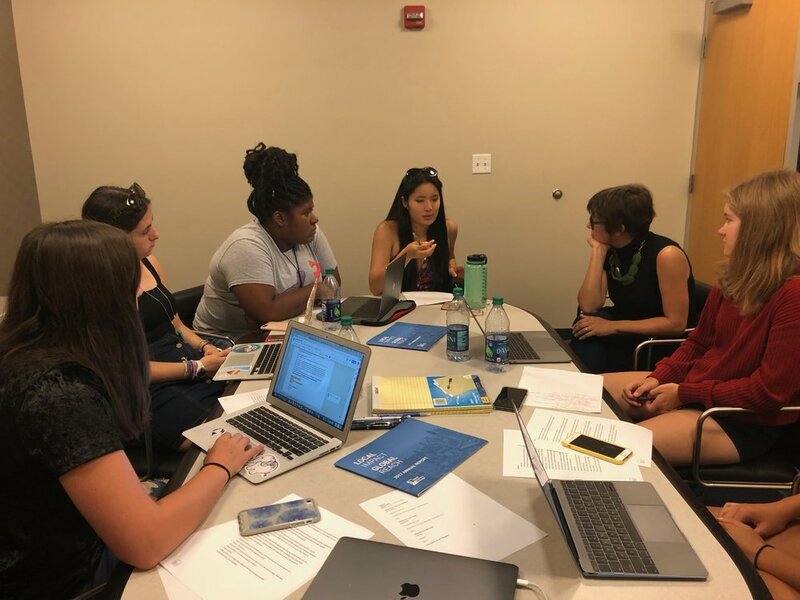 Brainstorming new ideas for the 2018-2019 school year, ambassadors Hannah Davis, Jessica Flohr, Antoinette Raggs, and Ema Takahashi engage in a discussion with National Advisory Council member Emily Easton.